"I have been doing these parties for almost 10 years now. I have really taken time to craft my style. I have used trial and error to figure out the best way to do the info packs to making the room absolutely amazing. Every game I find cardboard picture frames that match the theme, and then I take pic as everyone arrives. I then send someone to print them during the party. I hand these out at the end as my parting gift. This last party my room was AMAZING." "After years of watching us grown ups have lots of murder mystery fun, my teenage daughter was keen to have a party of her own. We chose Murder on the Dance Floor because we loved the 50s theme and it looked best suited to her teen friends. It was a fantastic success! Groups of friends from different social circles chatting and plotting away like they'd known each other for years. We made sure everyone knew they could dress up as much or little as they wanted and some of the costumes were just fabulous. We held it at the local church hall and the use of their kitchen and hatchway meant we could serve a simple menu diner-style. Hot dogs and sundaes were very popular. As always with Freeform Games, we loved the adaptability of the game (so could easily deal with three no-shows). The teens had an amazing time, they loved the stories, the intrigue and the mystery solving. We often struggled to stop them so we could move on. And the Dance Off was an absolute highlight! All in all, a huge success. Declared the 'best party ever' by my 14-year-old daughter and creating lifelong memories for her and her friends." "Exciting, lots to do, perfect!" "Very easy to understand, the info was clear: it was a very enjoyable and absorbing evening." "Very enjoyable, good pace, just the right amount to do." "Everything about the game was great!" 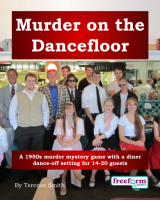 Murder on the Dancefloor is a dinner party murder mystery game for 14 to 20 guests and one or two hosts – download the free introductory pdf file. Join us in a thrilling evening of suspicion, double-dealing and murder. You will be in the middle of the action and it will be up to you to wheel and deal with the other guests. Can you achieve your goals, keep your secrets hidden and survive Murder on the Dancefloor? It's up to you. It's the 1950s, small-town USA: and tonight Flo's Diner is the place to be. It's the most popular place in town, and the local hangout for teens and adults alike. Neon lights flash out front, the checkered dancefloor sparkles inside, and the seats are polished to perfection. Tonight the diner is set to host the town's annual Dance-off competition. Famous celebrities have arrived at the event to help judge, while many keen locals and newcomers wish to participate. As the sun sets in the sky, the diner fills with people and the night begins. The dancefloor is flashing, milkshakes and burgers are being served constantly, and there's a great vibe of enthusiasm. But suddenly a terrifying scream echoes throughout the diner, causing panic! Local bad-boy, Ricky Johnson has been found dead in the male restroom by his best friend, Mikey Reed. Mikey found Ricky on the bathroom floor, with a fatal knife wound to his chest. With the local police officer already at the diner, everyone is told to remain on the premises. Detective Hudson has ordered all exits and entrances to the building locked until further notice. In an effort to not completely destroy the night, however, Flo has arranged for the Dance-off to carry on as normal. With the Dance-off only an hour away, and Ricky's killer unknown, many mysteries hang in the air: so just who did commit Murder on the Dancefloor? Murder on the Dancefloor lasts for about four hours and is suited to an evening. It is often played over a meal – a finger buffet if possible to allow guests to circulate and talk in private. "Lots to do, very clear, very enjoyable! I liked the way everyone has a list of things to achieve." The free introductory pdf file contains an introduction to the game, a cast list of all the characters, and a copy of the Weekly Herald – plus details of how to buy the game. Murder on the Dancefloor is unlike many murder mystery games. Although the game starts with a murder, most of the characters have more important things to do than to investigate it. And the killing may not be over – it is unlikely that everyone will survive the remainder of the evening! Murder on the Dancefloor is played just like a murder mystery game. You may be trying to solve the murder, but primarily you are (initially at least) concentrating on your own goals and objectives. Unlike most boxed murder mystery games, Murder on the Dancefloor lets you decide how to achieve your goals and thwart your enemies. "The evening was a huge success: I loved the theme and the whole game!" On the evening of the game the guests are met by the organizer, the Diner Manager, and welcomed to Flo's Diner. They then receive their detailed backgrounds – including dark secrets, objectives and money. The fun then begins as they form alliances, blackmail each other, steal items and maybe even try to murder one another! Along the way they may uncover some of the mysteries of Murder on the Dancefloor. Who is Bailey Higgins's father? Who attacked Penny Hodge? Who broke into the diner's safe, and who is the agent of a gas company? And, of course, who killed Ricky Johnson? Murder on the Dancefloor costs £25.00 (GB pounds) or US $39.99. You can buy it in either currency, from anywhere in the world, as you prefer. The price will be converted back into your own currency for you, at today's exchange rate. We offer a Cast Iron Guarantee on all our murder mystery games. If you're not completely satisfied with Murder on the Dancefloor then please let us know within 30 days and we will refund you. See our full terms and conditions here.